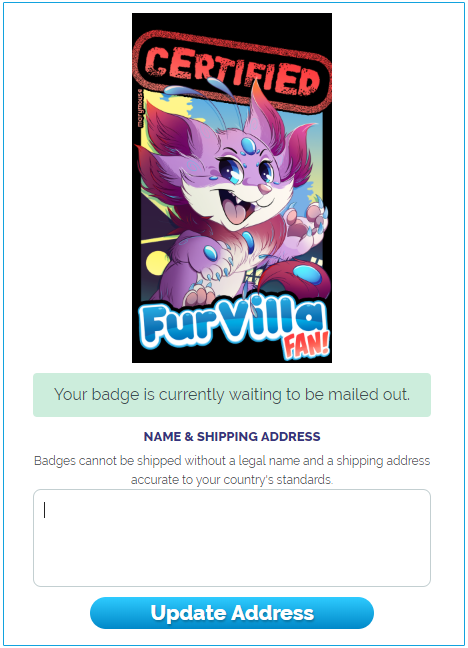 Certified Furvilla Fan Badges - Mailing Begins! Many of you have been waiting to receive your Certified Furvilla Fan Badge. I am happy to announce that the backlog has been worked through, and shipping has begun! IF YOU HAVE CLAIMED YOUR 90 STREAK BADGE BUT HAVE NOT RECEIVED NOTIFICATION YOUR BADGE HAS SHIPPED, YOUR INFORMATION IS INCOMPLETE OR OUTDATED. - Go to the dailies page by clicking HERE. Double check your address for accuracy. - Format your address according to your own country's mailing standards. This includes your name, street and number, city, country, zip code, etc. - Include a legal name, (this is especially important outside of the USA). If you do not do this, your tag will be addressed to "Resident". 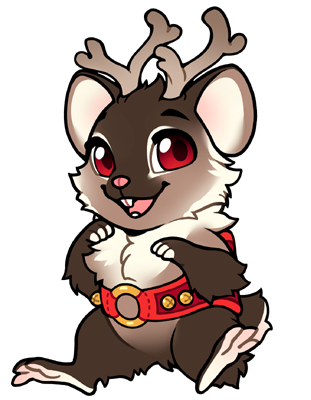 Furvilla is not responsible for any lost or mis-directed mail due to incomplete mailing information. - After double checking your information, click "update address". This will timestamp your update, and we will know that your information is correct. Please do this even if your address is correct. If you do not do this, your badge will not be shipped. We truly appreciate your cooperation in making sure your information is accurate. Your help goes a long way! To those still working on your 90-day streak, don't fret! All future badges will be shipped out in a timely manner. Just make sure you include your full mailing info. January has arrived (a couple days go) and with it comes new monthly goodies! First we have the Budgies! Tweet! Hop hop! It’s the Jumping Spider! FD Pets can be obtained from the FurDollar Emporium. They have five day breeding cool downs and are available for breeding until February 3rd. We’re still waiting on a couple bits but we have new Birthday Gifts planned for this year! Be on the lookout for a news post soon on how you can receive your missed bday gift if you have an early January birthday. Thanks for your patience guys! Just a quick reminder that the Snow Festival, Annifursary Event, and Cat Battlegrounds will all be closing down in a little less than an hour, we hope you all had fun with them! And first of the month items are slightly delayed but we will have them out ASAP and will be sure that everyone gets their full month of breeding out of the FDE pets. We're interested in getting your opinions on a future Beast Costume Base addition! Click the link below to vote for your favorite choice! Please enjoy a gift from Furvilla, this frightening pair of ferrets with fireworks! You will receive 2 pets using this code, but you may need to trade with each other or use breeding potions to get the pair you desire. All of us here at Furvilla hope that your 2019 is full of fun, luck, and happiness! Winter Contests and A Poll! We may have missed the mid-month mark by a little bit but better late than never right? Check out the contests linked below, they will be running until the end of January! We're interested in getting your opinions on a future Costume Base addition! Click the link below to vote for your favorite choice! Hey everyone! Just some quick new additions to the festival - mostly regarding everyone's least favourite career - warriors! Abyssal items are now craftable, you can pick up the recipe at the recycle shop! To craft this, you'll need Icy Antlers - which now drop 15% of the time in all Wandering Monster Battlegrounds, Deadly & Deadlier Monsters, as well as Cat Warriors. You'll also be able to occasionally find Star Fairies in these battlegrounds - they appear much less frequently (they're scared of combat, but curious nevertheless). The Icy Antlers may linger about a bit longer than the festival & the drop rates may be adjusted over the coming days - we'll have more specifics about retirement dates for these items soon! Snow Fest 2018 Is Here!!! Hello everyone and welcome to the third annual Snow Festival! It’s wonderful to see so many familiar faces, I’m thrilled to have all of you joining us again this year. But for all those newcomers, let me introduce myself, my name is Polaria, and I'm the mayor of Tigereye Peak. Soo...on behalf of my village and all its residents, we're excited to share this year’s Snow Festival with you! Now everyone grab some cocoa and cookies and have a seat, we have lots to talk about. Every year the snow fairies come out of hiding play with the residents of Tigereye Peak and help us greet the chilly winter season! 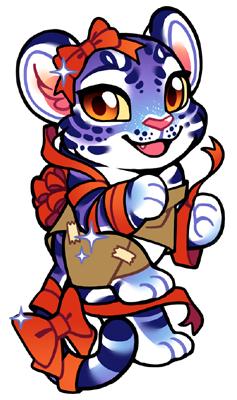 We've encouraged them to travel far and wide across Furvilla, so you'll be able to celebrate with them too! Each fairy has a special ability that'll bring a boon to your villagers. 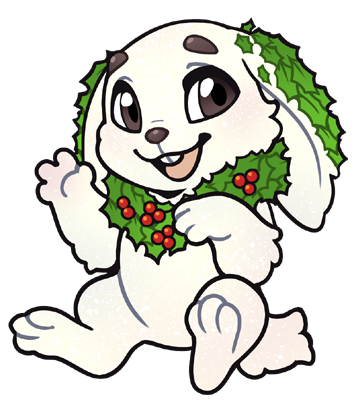 The abilities vary from giving you a cute holiday item to improving your village someway. 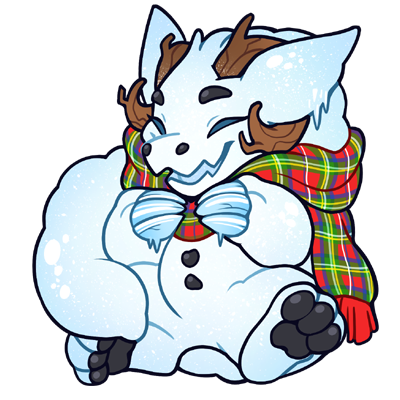 -Snow Festival Sticker Fairy: Grants you 1 random special Holiday Magic Chibi Sticker. -Snow Festival Bell Fairy: Adds 10% max durability to equipment it blesses (Legacy only). -Snow Festival Plush Fairy: Will bless you with one random non-magical plush. -Snow Festival Frozen Leaf Fairy: Grants 1 extra item for your next 10 Explore turns. 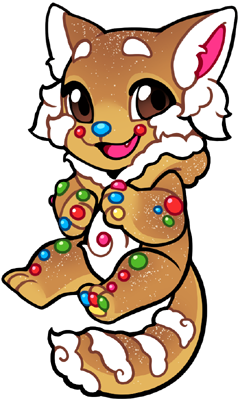 -Snow Festival Gingerbread Fairy: Adds 10% max durability to any structure. 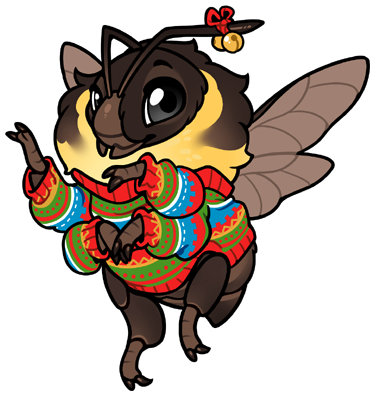 -Snow Festival Feast Fairy: Will bless you with 1 special holiday food item. -Snow Festival Ice Fairy: Blesses your inventory with one extra slot. -Snow Festival Snowflake Fairy: Adds one domestication point onto the animal it blesses. -Snow Festival Star Fairy: Summons a random Fairy friend, or if you’re lucky, maybe a special item. The Snow Festival Candle Fairy is also dropping again this year with new Keepsake stock! 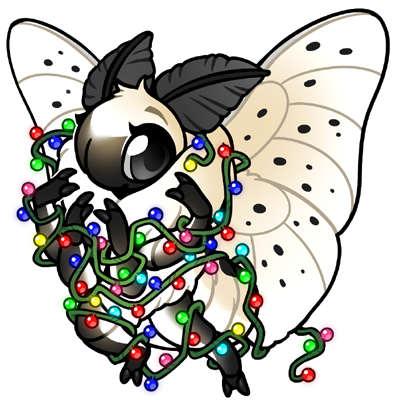 The Candy Cane Fairy will not be dropping this year as there is no new stock, we have instead added the Sticker Fairy and Snow Pet Fairy into the mix. You know, all this talk of fairies has reminded me of a story... You know it was a Frozen Leaf Fairy that led the founder of Tigereye Peak to the mountain where we all reside. In the cold of the night, Samuel and his exploration party were ready to give up. But then there was a beautiful golden light, and Samuel followed it to the caves and mountain crags where we live now. Because of this, you often see Snow Festival trees topped with a golden tiger -- a tiger, because Samuel was a tiger, and golden, because of the Frozen Leaf Fairy's beautiful glow. Fairies will befriend you while you explore (fairies will also be seen around the battlegrounds, more news on that soon). You'll encounter them easily at first, but as you collect a lot of fairies, they will slowly become more rare to encounter. But don’t you worry your pretty little heads, this resets every even hour. Click the stickers to see the full villager images! There are so many cute outfits that are available this year! One of the fairies will give you one of their Magic Stickers if you ask it nicely enough then voila, a brand new look! And sweet ones, please bear in mind these Snow Festival colors will be available only during this year's event, then they will retire. 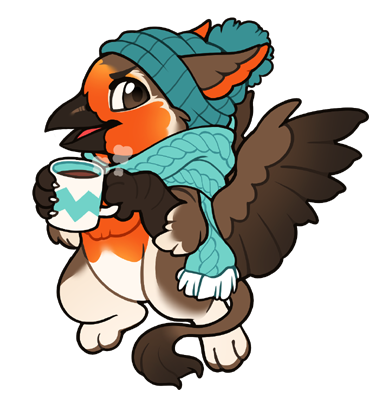 -All festivities end on January 1st 2019 at 11:59pm FV Time..
-Holiday Stickers retire and will not be re-released. 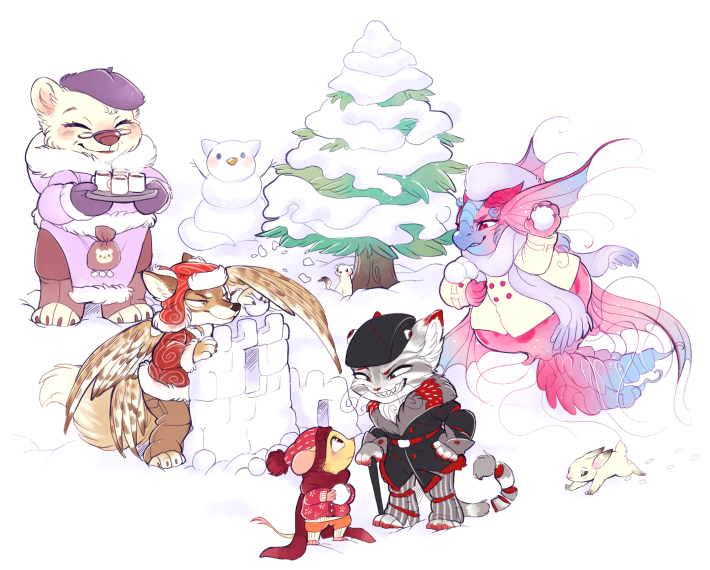 -Snow Pet Mini-Pets have a 1 Day Cooldown until 11:59 PM on January 1st, at which time they become unbreedable and retired. -Fairies are obtained from the Explore career, and begin with a 20% drop rate, decreasing by 1% with every fairy found to a 1% drop rate. This resets at the beginning of every even numbered hour. Fairies will drop until the end of January 1st. -Fairies will be appearing in the Battlegrounds area soon so be on the lookout for news regarding that! It's a bit sad to say, but we've had an influx of multi-accounters lately; people have intentionally been exploiting the mass award system to gain multiple copies of various items. This sort of behaviour is extremely unfair on those who play legitimately. Previously we updated the rules to state that multi-accounters will have all their currency wiped. People have claimed this is unfair - and while I agree to some extent that losing all your progress is unfair, cheating & exploiting the economy is a serious offense, and there's no simple way to go through and decide what items are legitimate due to the extensive amount of trading players do. To that end, I'd like to remind people to stop multi-accounting. If you are multi-accounting currently, please send a report - you won't receive an infraction, and we'll manually track down and remove items where appropriate. This amnesty period only applies through to Jan 1. If you do not come forward with a report, when you are caught multi-accounting all items and currency will be removed from your account. You will not be able to appeal this. Back with another reminder to use your Snow Festival Candle Fairies if you want any of the furniture items that they give out. We will be removing the furniture stock from those fairies and officially retiring all those furniture items. Snow Festival Star Fairies will also be having their items changed, please use them if you are looking to try and get the Happy Holly Festive Kitsune, Winter Wonderland Festive Kitsune, Festive Holiday Sword, and Festive Holiday Shield. 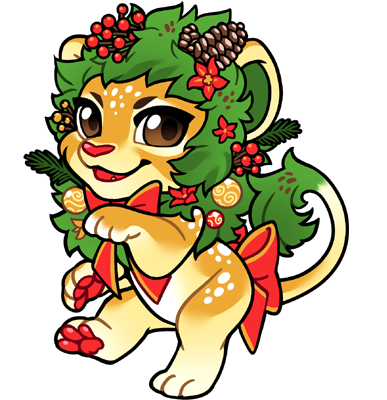 You will have until 12:00pm Furvilla time on December 16th to use your Candle Fairies and Star Fairies if you would like to collect any of the items currently in those 2 fairies! Thank you and have a wonderful night! That was a fun little break right?! No? You were as bored as I was? Well it was a necessary evil...We were able to roll out a few changes, which I have listed below! -You can now destroy seeds (cannot be used on fully grown plants) you’ve accidentally planted, removing them from pots. This will not use durability and will not refund the seed. -The charges bar for Warriors should now accurately represent the amount of charges left for villagers with a 25 charge cap. -Item museum now displays FD costs on recipes that require FD. -The Fair Exchange is now available - link is on the Town Hall dropdown. -The FDE now has its stock split into tabs! -New winter Village icons and some updated colors! -Inventory, Stall, and Storage expansion prices will now cap at 50,000 FC. -Wardrobe Slots now cost a flat 50,000 FC per slot. Be advised that the site may run a bit more slowly at first but should speed up after a bit. Please use the Reports link at the bottom of the page to file a ticket if you find anything going wonky around the site or with your account!